We are developing a new website that you can visit and bookmark using the following link. See Elvet Striders calendar for more details. A list of forthcoming events in the North East of England (and thereabouts) can be found on Barry Cornelius's northeastraces website, and on the Elvet Striders calendar. 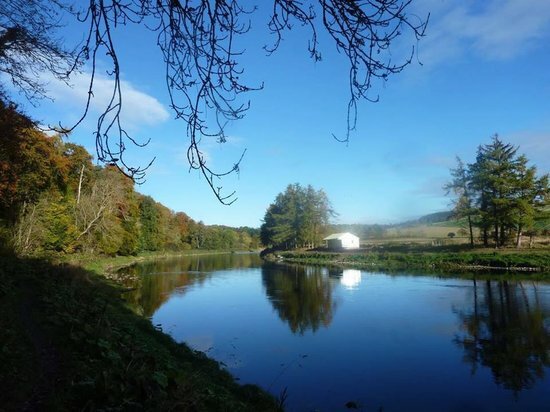 The Durham parkrun is our local parkrun, and starts at 9:00 am at Maiden Castle. The Striders Kit pages are in the process of being updated with photos of the currently available kit that Joanne mailed round recently. Contact Joanne if you have any questions or orders. or access rss feed directly. If you're interested in receiving website update emails and you have a gmail account, then you may subscribe here. If you don't have a gmail account but are still interested then email me and I shall add you manually. Unless you have a hotmail account. It doesn't like hotmail accounts. You can join or leave the email list via our Subscription Form. You can contact the club with any comments or queries via our Contact Form. 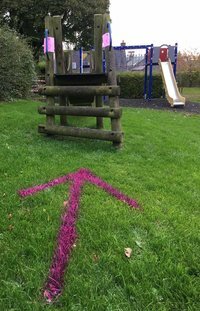 The new Elvet Striders website is live and available using the following link. Please visit and bookmark. This existing site will be accessible for archive/reference but is no longer updated. All relevant content from this website should have been migrated to the new website which is the best place to look for it. The run was all on cycle paths around a beautiful, bleak, mostly forested, wetland region! (So completely traffic free! Even though the area was cycle-path-tastic there were not loads of non-support cycles on any part of the route, so you were not having to look out for bikes.). It was very flat! Often the cycle path was on a raised embankment between channels of water. The channels of water ranged from narrow to large lake sized areas, colonised by birds and other wildlife. There was little civilisation! The route was measured and chip timed. There were water stations every 5km and warm black tea and bananas at the later water stations, which I avoided myself but the Dutch seemed very keen on it! All marshals were very friendly and encouraging! Like a Hardmoors on tarmac! It was low key and very friendly. About 200 entrants in the marathon. Mainly Dutch but a few from abroad. I arrived by train and metro from Amsterdam and wondered where everyone was!..but I soon saw they were all arriving by bike..of course! To try and run even pacing at 8 minute miles to finish in 3.30… by myself! So my the ‘Graeme Walton replacement system’ comprised of -all on my right arm-my sports watch, watch and a table written on the back of my hand indicating the times and times elapsed I should be at key distances! The weather was 5 degrees and dry, which was good running conditions it seemed, although in the areas without trees there was quite a strong wind. I started by positioning myself just ahead of the 3.30 pacer group as I wanted to make sure I didn’t miss the km markers. This worked well. I could hear the pacer group chatting away in Dutch in animated voices behind me, so I joined them for a few miles to chat (luckily they were happy to talk in English). I then returned to just ahead of them so I could see the markers again. The first 6 miles felt like we were out for a Sunday morning jog! Should I be running faster? The watch said no. I followed the cycle path through the watery marsh-lands! Part-way into the route we heard whistles from behind and a motor-bike then a peddle bike went past and then the front runners of the half marathon! That was an impressive sight! The first 5 guys were running as if their shorts were on fire behind them! Further on, the marathon and half-marathon route separated. There I came across a marshal standing on a small step ladder outside an isolated ivy clad cottage in the middle of no-where. He waved a red flag to the right (marathon route) and a white flat above his head (half marathon straight on). (Red for danger and white for surrender?). The cycle path continued through beautiful wild lands, a few sheep farms and woods. A guy from Portugal joined me for a bit then dropped back. From 30km onwards it gradually felt harder and harder! And at 38km onwards I found it really really hard! The last 2 km I could not help dropping pace slightly and the 3.30 pacer group overtook me! I finished in 3.31. After the race I went to the communal showers in the sports centre. They were cold! Is this a Dutch thing as the other girls were not batting an eyelid and were a bit amused by my shrieking surprise?! On the journey back I felt very nauseous, and was nearly sick on the metro and on the beautiful granite flooring of Rotterdam train station!. This was hunger as I only ate 1 jelly baby during the race. A big bowl of chips soon sorted it! Memo for next time: eat chips straight after race! Well, what a top day for a run! Cold yes, but blue skies and the sun is coming out as we arrive in Brampton. I enter the school and join the throng of club runners-it is buzzing with a cheerful vibe! And it's warm inside! After bumping into a few Striders here and there, I head outside as there is still half an hour before the start-so time for a short warm up around Brampton. Brampton is a pretty village indeed. I find a few quiet side streets to run along. I bump into a man walking his dog and his dog starts to run with me, so I offer to take him to Carlisle :-). Further about the village I spot a few other runners warming up-they are all male and not wearing much-they look like fast runners! Noting the time I head back to base to catch Mr Walton. Prior to now I have always ran how I feel. In races this has sometimes worked, and sometimes resulted in 'the Crash' when I have set off far too fast! So today, Graeme has very kindly agreed to run with me using his watch to pace us. So I get to see how it feels like to run a paced run and also to see how to use a watch. We finalise our plan just before the race. We were going to go for 71 minutes with a negative split pacing, but Graeme suggests trying for sub-70 as we seemed comfortable at 6.55min/m on the track for 10minutes on Wednesday ... I'm always up for a challenge ... so why not. We can always drop back to even splits if it doesn't work out. Graeme and I join the crowd, squashing in behind Stephen and Matt at the start-line. After 'the wait that is before every start' everyone moves forward like at a music gig when someone comes on stage ... and we are off! Down the hill, round the sharp bend and out of Brampton. It's a bit congested. Graeme keeps looking at his watch, and I just follow Graeme! The sun comes out. Nice views across the fields. Still a bit congested. I am warm now. I angle through a gap in the runners to throw my £4 hoodie that got from the British Heart Foundation charity shop last week to the roadside. (We'll drive back this way and pick it up if it's there, if it's not that's fine). Nice. We are into a steady pace now. I'm enjoying this. A down followed by an up and then onto the smaller road. Running. Nice country road, nice weather, what's not to like? Graeme keeps looking at his watch, he is keeping us in a good steady pace. As we go round a bend I notice 3 girls ahead. Hummm. I wonder if Graeme has noticed? Probably not. I wonder if his watch will notice if I speed up just slightly and creep past them? Hummm, we are not supposed to increase pace until Mile 5. Excellent I can see the mile 5 marker! Ha. I increase pace a bit and get past those girls . Graeme looks at his watch. Graeme looks at his watch. We have a mile 6 sign and then a 10k (6.2 mile) sign. It confuses me as I have done quite a few half marathons recently and this is half way, I remind myself it is a 10mile race. Graeme now suggests we don't increase pace til after the bridge, hummm maybe we went off too fast for a negative split for my level of fitness, I guess that is the danger of aiming too high. Well, if we can do even split that is ok. This mile was hard. I am not sure why! I just had to grit my teeth through it! This was a good mile. Graeme shouts out that we only need to do 2 more miles at 7 minute pace. Excellent! I can do this. Towards the end of mile 8 Graeme seems to be running faster and faster! Suddenly it feels like a time trial! Is this really still 7 min mile pace? It is uphill, maybe that's why it is hard?. I have also noticed 3 more girls ahead, I get behind them but it's hard to get past as they are running astride. Graeme is urging me on. A quote I read somewhere flits into my head. 'Racing hurts, get over it' that was easy to accept when sitting on the sofa ha ha!, however I'm not stopping now, I try and keep up with Graeme's legs! At this point it is clear Graeme could run the last bit faster than me, I think he should just go, but he doesn't as he is a Gentleman. I wish I knew where the finish was, then it would be mentally easier I think. But, its only 4 laps of the track I tell myself. Graeme is being very encouraging all the time. Why did they build The Sands so far away? We are now running with 5 ish other guys. My breathing is really loud! so I am pleased there is background traffic noise! Graeme urges me past them, and I try and manage an increase in speed for a bit, but I don't know where the finish is so slow down again. Graeme shouts out it's just round the corner, but I'm not sure which corner he means, there are people in the way! Aghh! And then the path is lined with people and low and behold the finish line is just ahead! Mr Walton is ahead but lets me pass just 1m from the line! What a good sport! ... And ooo it's so good to stop! ..After recovering Graeme checks his watch for one last time-wayhay! 1hr 09 mins! We did it! Thanks so much Graeme! This was really helpful! Graeme's watch showed that we did even splits. .. ha. It's funny how different a 7 min mile feels at the start compared to at the end! I really enjoyed this race and I would definitely do it again! It's a nice route and a good club event! I woke up this morning feeling just quite bleurgh about the day. It was more that I just felt like I couldn’t be bothered to run 10 miles. I just wanted to stay in bed. My legs were tired from the thousands of steps I had walked delivering leaflets this week and my mind was tired because.. Well just because…. But I battled on and got up. Task 1 complete. Task 2 was to actually get ready for the race. Loads of self doubt just kept giving me this mental block. Even down to the smallest things like which gloves to wear and which top and the thought of these things was giving me a sense of dread ! It was weird! I got ready anyway and made it to the bus. Our running club puts on a bus for some of the races and this was one of them. As soon as I got on the bus and saw my friends I felt better. I think it’s being around other people. And when those people are smiley and happy, I think that’s infectious. They build my confidence. Not only around running but all aspects. I don’t think I’ve ever had so many people believe in me. So when I’m asked what’s helped in my recovery I have to say not only running but the friends I have made through running. I’ve only known them maybe 18 months but already they feel like family. Once I’m in this mindset I don’t seem to be able to pull myself out. A couple of friends caught me/I caught a couple and that gave me a little boost, enough to get to the end. I just wish my mind was as strong as my legs. I don’t think it’s just me who experiences this though, right? So I finished. 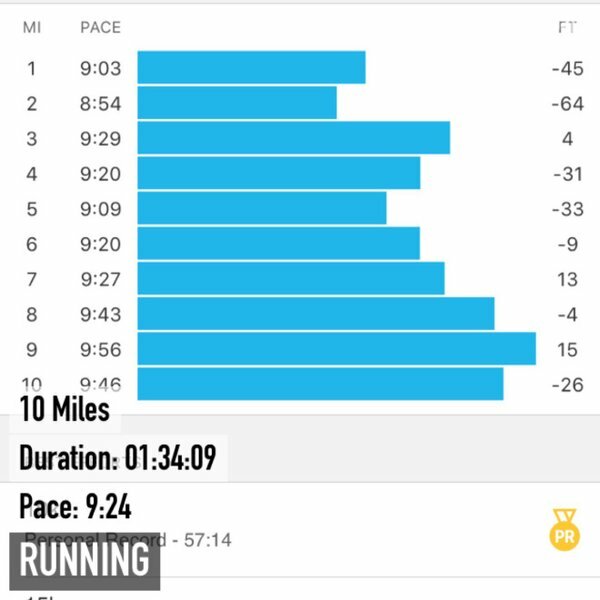 My average pace was 9:25 which I was disappointed with but it did teach me what I need to do about pacing for this half marathon in January. I just wish I could get some sort of magic pill that kept my mind strong. Overall I had a great day. Even though I was slightly disappointed in my time, thinking about it, I really beat myself up and criticise myself and I think I need to be kinder. I keep trying to think that I wouldn’t criticise a friend for going slower than hoped for and I would be proud of their achievements. Just wish I could think like this for myself. The day was rounded odd perfectly – dinner, pudding and wine with friends and then a few gins, Xfactor and I’m a celebrity. Not the most healthy food and drink choice but hey ho we all need a treat. Here are my splits from yesterday – they’re hilarious and certainly shows where I went wrong! 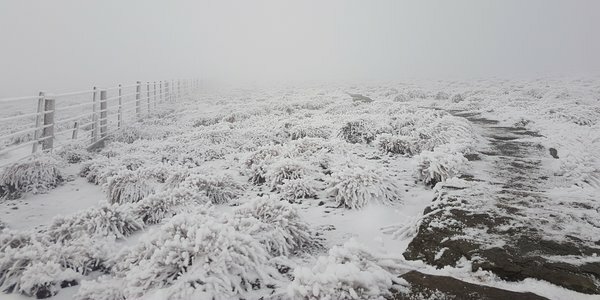 I’d battled with myself as to whether to enter this race for a while then late on Friday afternoon, race organiser Garry Scott posted a video on the Trail Outlaws Facebook page from a very snowy Cheviot summit. By the time the video had finished my mind was made up, I was in and luckily just in time as entries would close very shortly after. So forward to Sunday and I left the warmth of my bed and headed up to Wooler for the Wooler Trail Marathon organised by Tim Bateson and Garry Scott of Trail Outlaws. I first met Tim a few years ago on a recce of the Hardmoors 55 and kept in touch ever since as he’s grown Trail Outlaws. 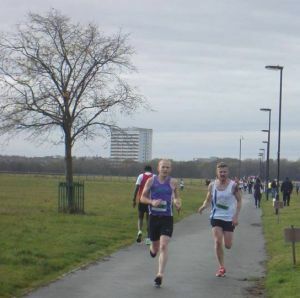 I ran their first ever race the Pieces of 8 half marathon, but since then the races have grown to include several ultras and marathons across the north east and Northumberland. 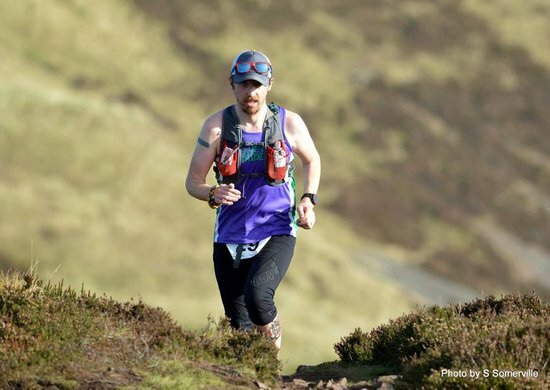 Tim’s a great guy and his passion for running and in particular, the Chevy Chase fell race held each summer in Wooler, being the inspiration for this particular race. Registration was in Wooler YHA and was quick and efficient although I did get there rather early just to be sure. As more runners arrived I spotted Dougie Nisbet who was also running the marathon and had a quick chat before making my way out into the cold for the race safety briefing before we were led over to the start line just over the hill for the race start. Taking in much of the first part of the Chevy Chase, the Wooler Trail Marathon snakes its way through the valley to the base of the Cheviot before a long climb to the summit. Race day was cold but could have been a lot worse, and thankfully the low temperatures meant that the ground was pretty much frozen solid which made for good running. Onwards and upwards towards the summit the field of 140+ runners was well stretched now. I’d started from mid-pack and took it easy, running at a pace that felt very comfortable across the undulating trails knowing that if I set off too fast, I’d suffer badly at the end. As I trudged up the long frozen path to the summit of the Cheviot I passed a few other competitors but was conscious to maintain my pace so that I never felt like I was working too hard as gradient rose above the low cloud line and the perma-frost turned to snow and ice on the ground. Near the summit a hardy marshal was stood to make sure runners were ok and guide us up over the ladder stile and on to the slab path heading to the summit. The summit of Cheviot is big and flat and the low cloud and snow covered floor blurred together to hide any visual cues that helped you identity you were approaching the top. Then after a few minutes of running the large summit cairn came into view. I touched and then was off, following the treacherous slab path of the Pennine Way off the summit and down towards the check point being manned by Phil Owen. I gained quite a few places on the long downhill as others cautiously made their way down the frozen trail paths. I found it much quicker, and safer, to find a line in the overgrowth, let loose and put faith in my Walshes and balance. It worked and I made good progress and the race now followed the trails of the Pennine Way before heading across the border into Scotland. A sharp turn brought us off the Pennine Way and back across the border into England onto the St Cuthbert’s Way long distance path. Back on lower ground below the cloud line the scenery was jaw dropping as I took time to savour where I was running. 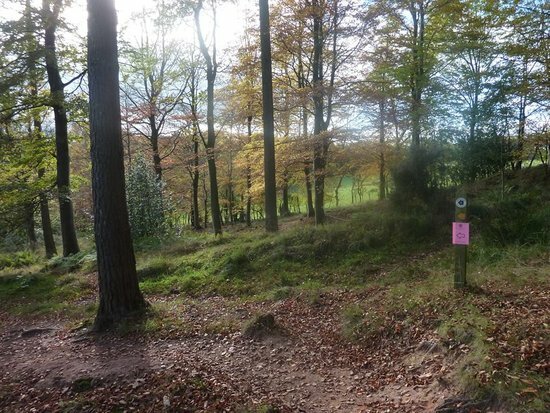 As the route snaked its way back towards Wooler there were still plenty of twists, turns, climbs and surprises on offer, the trail through a dense wood at around 18 miles being rather inspiring. I was still running well and feeling really good but know these races too well to get carried away - there’s always a sting in the tail on something like this. Because of my very late entry, I’d not noticed that this race was actually 28 miles so on approaching the final climb of the day I had in my mind there were only a few more miles left to go. I made the decision to push on a little as I could see a couple of runners ahead of me that seemed to be slowing so thought I’d try catching them. I made good ground and could feel my heart and lungs really starting to work hard as I picked up the pace and eventually with Wooler in sight, I realised I might have further to go than I thought. The runners I was tracking were soon out of sight as I hit the road for the final mile back to the YHA feeling tired but strong and with a massive smile on my face at the quality of the course I’d just completed. The finish was inside the hostel, I was given my time - 5hrs40mins finishing in 32nd place. The t-shirt and medal were well earned and the kitchen was stocked with loads of hot soup and bread to help warm up. This was a fantastic first race with lots of potential to become a real winter classic. I take my hat off to Tim and Scott for devising such a good route. This is one of the Esk Valley races which I’d always fancied as it starts in Levisham, a lovely village where I’d been on holiday a few years ago. 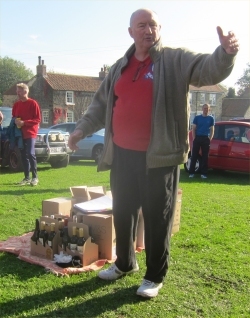 A few weeks before the race it was announced that this year’s would be run as a memorial to Dave Parry, who had been the face of Esk Valley races for years and had recently very sadly lost his battle with cancer. After hearing this I decided that although I’m cutting down on races, this would be one to put in the diary. 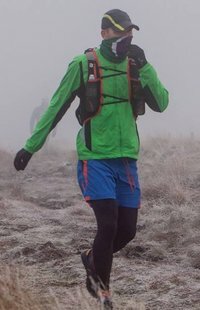 As the day approached the weather forecast was not the best – a part of me was quite pleased though as it had been a while since I’d run a race in bad weather and I do always enjoy the extra challenges it can present. However as we drove down I reminded myself you should be careful what you wish for. The rain was heavy and the winds strong and I started to wonder whether I really wanted to run in this. On arrival the rain kept coming and going – I think I must have changed my mind about whether to wear my waterproof about 5 times but when we lined up at the start and it started to hail I realised I had to face the fact that this was going to be a wet one… There was a decent turnout of Striders to pay their respects to Dave and the cheer when his name was mentioned went on for a good long while as was fitting. It didn’t feel right to be running one of these races without him there to send us off.. The last part of the race was fairly easy with nothing too steep and less difficult underfoot – although there were some impressive puddles a couple of which had me submerged up to my thighs. As I slowly picked off more runners I spotted Shelli Gordon ahead. For those who don’t know Shelli, she is an amazing runner who wins pretty much all of the Hardmoors races. I tucked in behind her as I didn’t think I had a chance of beating her but as there wasn’t far to go and I still felt good I decided to chance it. Once I was past her I noticed someone else I recognised way ahead of me. With not far to go and a fairly flat last half a mile I thought I should try and catch him. I’ve only ever managed to beat Tom when he fell at Captain Cook’s and it would make my day to manage it today after such a shocking start. However there were still about 6 people between us and a long distance. I started to make ground, passing a couple of people but then he turned and saw me and immediately sped up! I did my best to catch him, passing the remaining 4 or 5 people who separated us and doing my best to sprint the last section back into the village but it was not to be. I did however pick up a prize for third lady and very much enjoyed my cake and tea in the village hall afterwards. *Nigel Heppell. Two Ps Two Ls. And now an extra S as well. You can never have too many Nigels. The onset of a head cold during the week, coupled with the fact that this wasn’t my 'A race' meant that my expectations weren’t especially high – perhaps a good thing as it is emerged. I knew I was in pretty good shape after a 6-7 week block of heavy training following the Great North Run. This training programme, under the guidance of Allan Seheult, was interspersed only with a couple of cross country races and I still maintain a lot of my road PBs have been earned, in some part, during those slogs around the North East Harrier League. As we travelled on the Metro to the start I explained the nuances of the course and how he should attack it - don’t charge off like a madman at the start being the main focus of my advice. Then it was the tough part in my eyes - the climb up the A184 to Heworth and White Mare Pool. This takes me past my office so I know it well. I kept a steady pace and tried not to stumble on people ahead. Miles 10 to 12 are always tough with the steady climb towards the coast, and as I approached the top of the hill just before the roundabout I was greeted with cheers from the Waltons. They gave me a much needed boost but Graham’s shout of "Paul (Swinburne) is just ahead" gave me an incentive to push on.